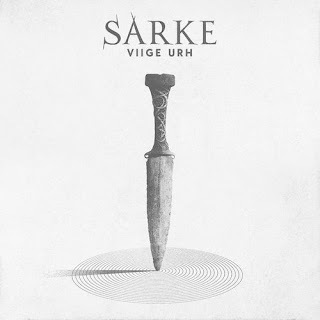 Sarke are a band from Norway that has been featured before in this zine and plays a very raw and atmospheric mixture of black and thrash metal and this is a review of their 2017 album "Viige Urh" which will be released in October by Indie Recordings. A very heavy punk influenced sound starts off the album along with some angry vocals that gives the music more of a first wave black metal vibe while the music is more rooted in the early 90's Norwegian second wave style as well as adding synths in certain sections of the recording. A decent amount of melody can be heard in the guitar riffing while the solos and leads are done in more of an old school metal/punk style and as the album progresses a small amount of acoustic guitars can be heard, a couple of tracks also brings in a brief use of psychedelic elements and female vocals and all of the music sticks to a mid tempo direction. Sarke creates another recording t hat remains true to the raw and atmospheric mixture of black and thrash metal that was established on their previous release, the production sounds very professional while the lyrics are written in a mixture of Norwegian and English and cover evil, darkness, and occultism themes. In my opinion this is another great sounding recording from Sarke and if you are a fan of thrash influenced Norwegian black metal, you should check out this album. RECOMMENDED TRACKS INCLUDE "Dagger Entombed" "Jutul" and "Evolution And Fate". 8 out of 10.